Wedding flower bouquets are available in a wide range of unique shapes and breathtaking bouquet styles. 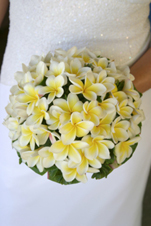 Wedding flower bouquets can be formal or informal. They should complement the wedding theme, color scheme, and wedding attire of the bride and bridal attendants. Experienced, talented floral designers can tailor wedding bouquets to fit individual preferences. There are endless possibilities when it comes to bridal bouquet ideas. This bouquet is tear drop in shape. When held, the rounded end faces up towards the face, the pointed end faced down towards the ground. This bouquet is a traditional teardrop, with a “shower” of flowers and foliage cascading from the pointed end. Sheath bouquets are meant to be carried along the forearm (cradled). Usually a bundle of long stem flowers tied together with a strip of ribbon, lace, or tulle. This classic bouquet is round and compact. There are two basic styles; formal and informal. Informal styles are hand-tied and loosely structured. Formal Posy bouquet styles are tightly structured. Flower stems are replaced with wire, making the bouquet light and easy to carry down the isle. Nosegay bouquets are round in shape (similar to a posy). Typically, they have less flowers, and more foliage and adornments (tulle, lace, pearls) than posy bouquets. The Beidermeier bouquet is round, with flowers arranged in rings by color. Flower species can be varied throughout the bouquet. Flower stems can be wrapped, tied, or wired. A ball of flowers wired together hang from a loop of ribbon, lace, or tulle. This bouquet is ideal for young member of the bridal party, such as flower girls and junior bridesmaids. Flowers and foliage are arranged in the shape of a crescent moon. The elegant floral arc is held in the center with a single-handed grip. Crescent bouquets can be symmetrical or asymmetrical. The left and right sides or a symmetrical design are even in length. Asymmetrical crescents have one side longer than the other. A Composite bouquet is graceful and elegant. It is made up of individual flower petals wired together to form one beautiful bloom. Constructing this bouquet is labor intensive; however the final result is stunning. Clutch bouquets are a popular choice for outdoor weddings. Flowers and greenery are gathered together, their long stems tied together with ribbon, tulle, or lace. Freeform bouquets do not follow a specific bouquet style. This type of bouquet is perfect for the artistic, creative bride. Free from bouquets can be bold and elaborate, or simple and elegant.